On Saturday, December 13, the Connecticut Society will join the Maine State Society and thousands of other volunteers for the fifth year in a row for a wreath-laying ceremony at Arlington Cemetery to honor the men and women of Connecticut and the nation who have served in the military. 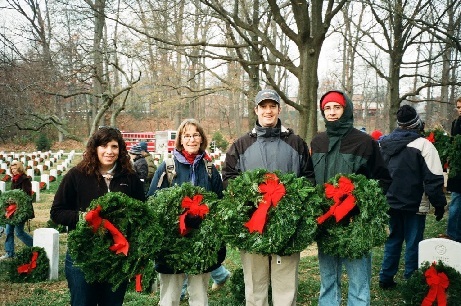 Click here to join us for this year's wreath laying. Connecticut Society volunteers will meet at 9:00 a.m. at the main entrance to the Cemetery - look for the group with the sign stating "Connecticut State Society". Participating in the wreath-laying ceremony continues the Connecticut Society's tradition of supporting the men and women who have served in our nation's military. In the past several years, we have participated in American Warrior's Day of Honor for World War II veterans and flown the Connecticut flag at the National Moment of Remembrance at the U.S. Capitol. There will be a short welcome and briefing of all volunteers at 9:00 am at the Memorial Amphitheater near the Tomb of the Unknowns. There will be signs directing you to the location. We will start placing wreaths at approximately 9:30 a.m. There will be special wreath ceremonies at the President Kennedy's family memorial at 11:00 am, at the Mast of the Battleship USS Maine at 11:30 am, and a final special wreath ceremony at the Tomb of the Unknowns at 12 Noon. During this season of giving, please join us in honoring the fallen soldiers at Arlington. If you plan to meet up with the Connecticut Society group, please RSVP online by clicking here. If you have any questions, please contact Max Gigle at maxgigle@gmail.com or 860-550-4848. The Connecticut Society of Washington, D.C.